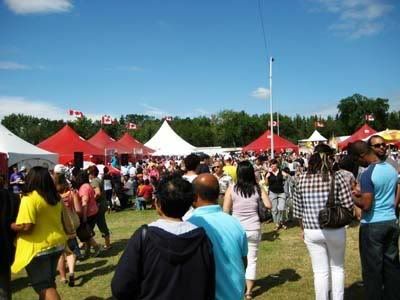 Heritage Days is one of my favourite festivals in Edmonton, because it really showcases the diversity in cultures we can find here in Canada. Well, I guess thats not my only reason I like it, I also go there pretty much for all the different food I can try! Every year before heading out to the grounds, I check out the extensive menu with food offerings and try to figure out exactly what I'm going to eat. From then on, I calculate the number of tickets I need and how much money to bring - I know, so nerdy, right? oh well! As long as I get my food, I'm happy! Waiting in line for tickets! 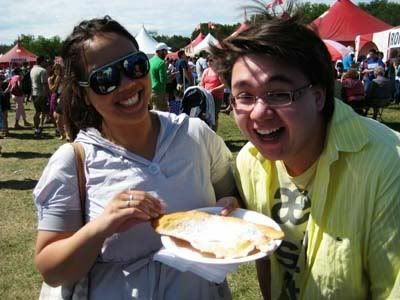 Once we arrived at the festival, we knew exactly where to head - the food tickets distribution! Unfortunately for us, the line was SO LONG. We seriously waited about 40 minutes in the line up before we were able to pay! We made good use of our time waiting and picked up 30 tickets for ourselves and 30 tickets for Andrew & Crystal, whom were on their way to the park. So many people at the park! 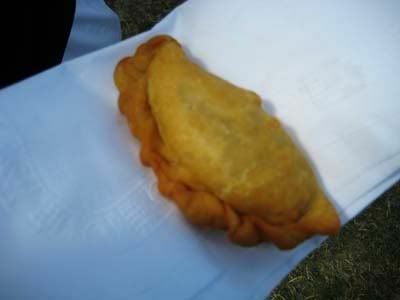 Our first stop was at Ecuador, to try out their Empanada de Carne for 4 tickets. Lets just say that getting that one small empanada for 4 tickets REALLY wasn't worth it! It tasted good, but for the 4 tickets I was expecting to get more than one! Next stop was at the Borneo pavillion, where we chose to try the combination plate since we were pretty hungry! The plate was a total of 10 tickets, and relatively worth it for the portion size we received. 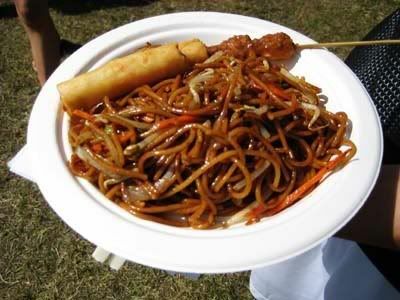 The plate had mee goreng, a spring roll and skewers. I always thought that the traditional mee goreng people cooked would be similar to those packages of instant noodles that you buy at Asian supermarkets. Guess I was wrong, because it really was like a stir fry noodle, nothing too special. The spring rolls were good though, I guess. I love, love, love Thai & Laos cuisine. One of my favourite restaurants in the city, Syphay Restaurant, is actually owned by the family of some friends of mine, and its always nice to see their familiar faces out here at the Heritage Festival. We chose to go with the dessert option, Kao Sankaya (4 tickets), which is sweet coconut rice with mangoes on top. Kao Sankaya :) mm yum! I always love this dish because its warm and sweet. 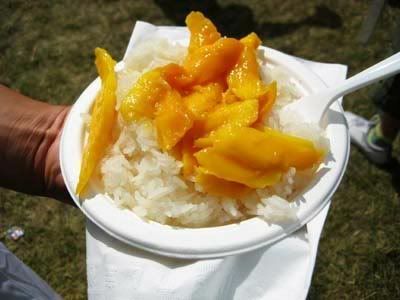 The sweetness of the rice is matched by the natural sweetness of mango, and the two together are just a little bit sticky, almost making it into a glutinous rice dessert. Mm YUM. Our next choice of food was bolani from Afghanistan (6 tickets). 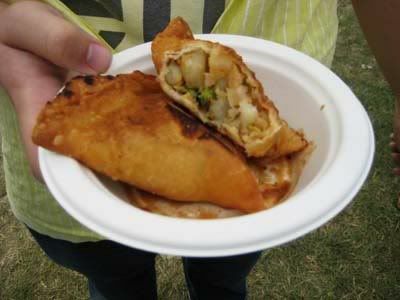 According to their description, bolani is "Pan fried dough wrappings, stuffed with potatoes, green onions & spices". Thats pretty much what it was. It was a flat piece of dough infused with those ingredients, and it came with a yogurt dipping sauce. All in all, a very good dish, because the flavours were perfect when put together with the yogurt dip! Now on a hot day like today, we needed a drink to cool us down. 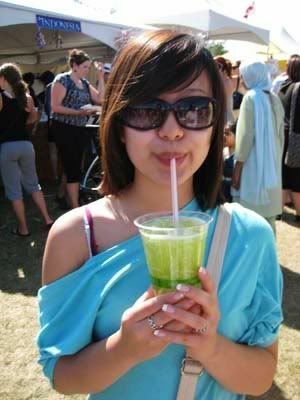 I remember from the year before, we got this drink called 'Bali Delight' (4 tickets) from the Indonesian tent, and I was so happy that they had it again! There is both a cantaloupe and honeydew version of this drink, and both of them are very delicious! It's basically the melon thinly shred, and put in it's own juice and sweetened with sugar. I don't know what I like more about the drink, the unique texture of the melon strips, or the refreshing sweetness! 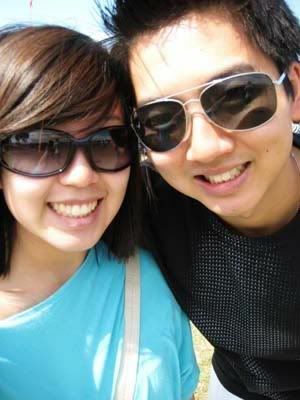 refreshed from the bali delight.. ready to continue eating! It was getting hot, and we were starting to get very full.. but we had to kept going! Our next stop was at the Philippines tent, where we waded through the crowd, hoping to try what sparked our interest most: pancit! 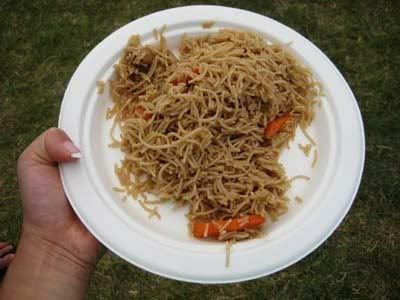 I believe pancit is a stir fried vermicelli noodle dish, with meat and vegetables. 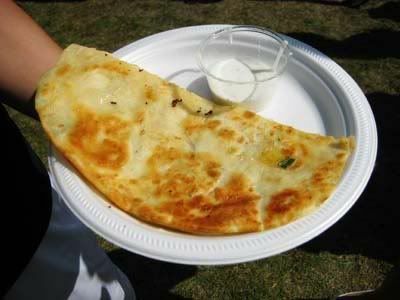 Surprisingly enough, I think this was the dish of greatest 'worth' at the festival. This was a large, full sized plate of noodles, all for 4 tickets. We know where to find me next year, haha. Anyways, the noodles were very flavourful, and not soggy or anything. I highly recommend this one. Also, tons of people lined up for the special drink 'halo halo'. It's more of a dessert I feel, where fruit is mixed with crushed ice, milk and sugar. Maybe I'll check it out next year! Pakora, worth more than empanadas! 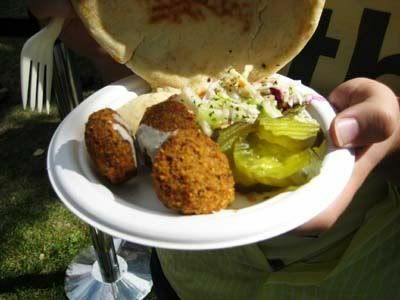 For our last dish, Vince wanted to try sukumawiki from the Kenyan tent, and Andrew wanted some falafel from Israel. The falafel from Israel was tasty, not something I usually go for, but in small quantities it's okay! It was a good deal since the falafel was accompanied by hummus, salad, sauce, and a pita, all for 6 tickets! Now for the sukumawiki.. oh jeez, this one took forever to get! The tent only had 2 ladies working, and their system for ordering, lets just say it was extremely inefficient and I will leave it at that. The volunteers that come together to work this festival are amazing, so I will say nothing else! We waited approx. 30 minutes to get our plate, but I think it was worth it! 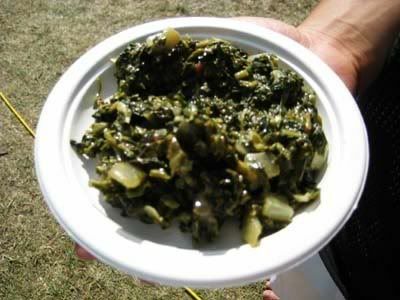 Sukumawiki is a traditional dish, where kale is stir fried with spinach, onions and tomatoes, then topped with coconut milk and cream. It tasted delicious, but if anyone is going to order this, make sure to get a side of rice with it! By itself, it is very flavourful and almost overwhelmingly rich. 30 minute wait was relatively worth it..! Another great year of celebrating cultures and amazing food.. can't wait for the next 365 days to pass so I can go and try out new things!